Inquiry 3- If you are looking at something that you don’t like while you are eating one of your favourite foods, does your eating experience change? | Leif H.
The reason why I chose this experiment was because I was wondering if it would matter if you like something while knowing that you could have gotten something worse. The two kinds of candy (the favorite food) that I picked to use were Coffee Crisp and smarties, and the one kind of bread (the worse food) that I used was whole grain. How I did the experiment is down below, but I forgot to give them water in between foods. Step 1: Have someone you know agree to do this experiment with you. Step 2: Have them, without knowing that there is a bread, eat candy. Then repeat, but with bread instead of candy. Step 3: Have them record their satisfaction level after eating each food. Step 4: Sit them down and put a food that they like(candy) and a food that they don’t like as much(bread) in front of them. 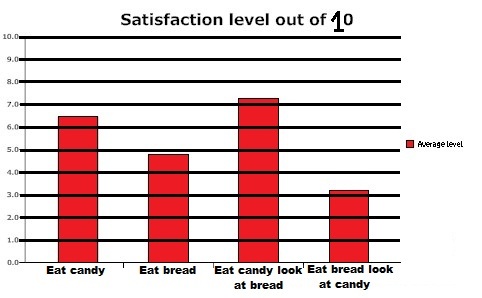 Step 5: Have them eat candy, and have them record how they liked it on a scale. Then put another sample of candy on the table, have them wash out their mouth with water to prevent the results from being messed up. Step 6: Do Step 5, but with bread instead of candy. The results are recorded down below. So, as the average score shows, on the average most people feel better about eating a tasty food while knowing that they could have gotten bland food than when they only ate the tasty food. One out of the five people did not see the difference. A couple of ways and how these ways could have made the experiment better- get more people to volunteer, this would make the info more accurate; do the experiment in a room where there are no other people, other people can effect results with their comments; put the foods on plates or in containers to pass to the test subject, you would probably prefer to eat food on plated instead of being handed the food; and have the same amount of females do the experiment as males, females might have different results than males. Of course, this was a project based on bread and candy, so this could vary for different foods. Using Gmail, I had asked to interview a person who wrote a book about taste, she said that she was willing to answer my questions, and I gave her my questions. The questions that I have asked her are written down below. How much do you know about how the human sense of taste works? Answer— Obviously, I think taste is pretty important or I wouldn’t have written a book about it. All the senses are important, and I was interested in taste because in philosophical tradition, it is often dismissed as too “subjective” to mean very much. A lot of the book is devoted to arguing against that position. That also gives you a sense of why I wrote a book on taste. But there is an additional reason: I work mainly in aesthetics, and in that field “taste” is a dominant metaphor (aesthetic taste, good taste, bad taste, etc.) In its metaphoric usage, the literal sense of taste is discarded. So I set out to examine just why this is, arguing that in fact this indicates a misunderstanding of the function and significance of literal taste experiences (i.e. eating and drinking). How important do you think that taste is? Answer— I’m not sure I understand your last question. One eats different sorts of things, so I guess if I discover I missed an opportunity to eat something different, I would just try it out the next time the occasion arose. Wow that’s a cool project!! Gr8 job!! Is there any candy left over? Are you the Lyle from my school last year?